A romantic comedy, Look Who's Talking offers standard fare enhanced by a likeable couple and the expressed thoughts of a baby. In New York City, Mollie (Kirstie Alley) is an accountant, deeply in love with her client Albert (George Segal), the only trouble being that Albert is already married and just stringing Mollie along. He anyway gets her pregnant, although Mollie tells her mom Rosie (Olympia Dukakis) that she chose artificial insemination. On the day of the delivery Mollie has to scramble to the hospital in a taxi driven by the scrappy James (John Travolta). Baby Mikey (voice of Bruce Willis) is born, and Mollie goes on a quest to try and find a suitable father, without much success. James continues to hang around Mollie, offering babysitting services, and gradually they grow close. Written and directed by Amy Heckerling, Look Who's Talking provides the novelty of a baby who can share his thoughts, with Bruce Willis mailing in a relatively wooden voice role. However, the talking baby trick eventually and not surprisingly wears off, particularly as Mikey ages into a toddler. Look Who's Talking remains mainly watchable thanks to the two central characters, the dynamic between Mollie and James seasoned on a low fire as Mollie desperately searches for a father and ignores the most obvious option available to her. 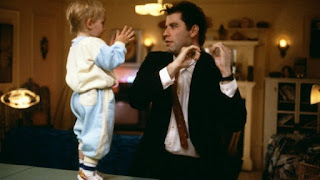 John Travolta triggered one of many career upticks by portraying the streetsmart James and having fun with his own screen image, and Kirstie Alley threatened big screen stardom in an appealing role as the frazzled Mollie. Heckerling peppers her film with enough good laughs to sustain momentum, starting with detailed what-happens-during-conception imagery. Mollie is good at imagining worst-case-scenario futures with the magnified faults of the men she's dating. The pseudo-psychological babble of the highly unreliable Albert also helps in the comedy department, as does mom Rosie's pragmatically unimaginative advice on affairs of the heart. None of which means the film is anything except utterly predictable, with the ever-popular frantic chase ending that brings the two lovers into each other's arms. It doesn't matter who's doing the talking, a rom-com is a rom-com.